Not long ago, a General Contractor who had been working on a $60,000 remodeling project in a Baltimore resident's kitchen came to us when he was faced with a dilemma. While the homeowner was thrilled with the renovations that had been done in her kitchen so far, she wasn't yet happy with the floor. Finding a Baltimore grout recoloring company with enough expertise to deliver the aesthetic results she desired was no easy task for the General Contractor. 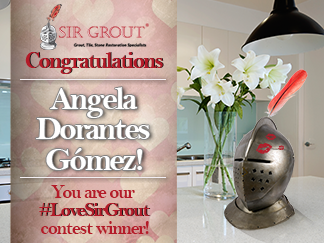 Just when he started to think he was all out of options, he heard about Sir Grout of Baltimore. After speaking with us briefly, he knew we'd be right for the job. An appointment was then scheduled for us to come out to the Baltimore resident's home later that week. When we arrived, the homeowner invited us inside and led us into her kitchen. As we looked around the room, we noticed a blatant difference between the recently remodeled elements of the kitchen and the yet to be restored tile and grout floor. The floor's grout lines would be the primary focus of this project, so we needed to decide what the best course of action would be to fix them up. After taking a closer look at them, we came up with a few possible options for the homeowner. However, immediately after telling her about the Stainmaster epoxy grout we could use to recolor the grout lines, she was sold. At Sir Grout of Baltimore, we take pride in only using products of the highest quality and, as many people know, the Stainmaster brand is well known for having this attribute. One of the greatest advantages of this product is that it comes in a variety of colors so it can be used to match almost any color scheme. Also, it's waterproof as well as stain resistant. This makes it easy to clean since, no matter how much foot traffic or usage the tile and grout floor may experience, its grout lines will remain spotless. Further, when we use this grout, the customer is given a 5 year warranty on it since we know they'll be completely satisfied with their floor for at least that long. Once we told her all these benefits, there was no doubt in the Baltimore homeowner's mind that this was just what her floor needed. When we were done, we called the homeowner back in so she could see her freshly restored floor. She couldn't believe her eyes! The grout lines matched her cabinets perfectly. Before saying goodbye, she thanked us for having added her dream kitchen's final touch. If you're also planning to remodel your kitchen, or if you're in the process of doing so already, we'd love to help out with any hard surface restorations you may need. To schedule an appointment, please visit our Contact page or give us a call at (667) 401-6700.